While at the University Of Wisconsin/Madison in 1978, I made myself a Batman costume for that year’s Halloween festivities. I went all out and used blue skin-diving Neoprene head gear for the mask, a long, flowing blue satin cape done by a local seamstress, gray Danskin tights and body suit, yellow leather belt with tapered wooden dowels and brass buckle for a utility belt, and blue fabric gloves with bat-gauntlets sewn on – I even had a shoemaker sew rubber soles onto blue stretch socks. Unfortunately no pix exist – I assure you, if they DID they would’ve been posted on Facebook long ago. … It was a terrifically successful endeavor and Halloween was a trip that year ! It occurred to me that my brother Adam had his 8th birthday coming up at the end of November, around Thanksgiving, and so I decided I’d make an appearance at his party in nearby Chicago. I took my shopping bag of “attire”, went into the “fragrant booth,” and about two minutes later emerged as Batman and ran across the street into the party. Needless to say, I’d love to have had pix of the expressions of the construction crew. … I had brought a Batman poster with me to sign for Adam, as well. 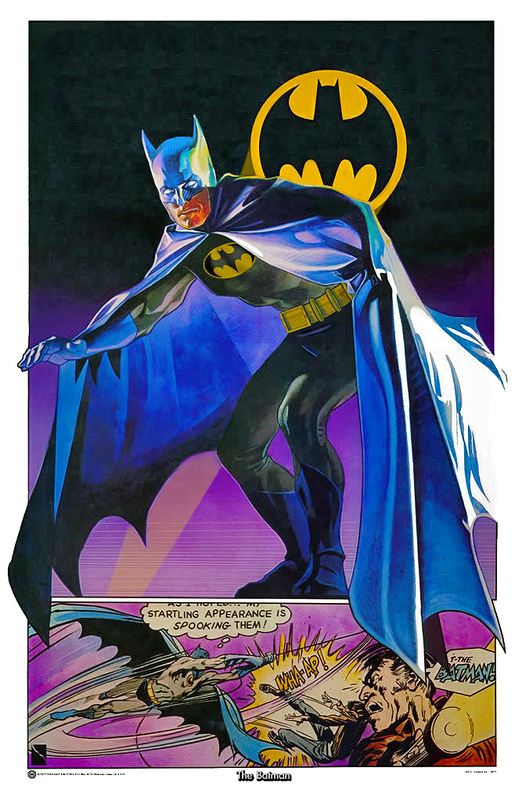 A copy of the Drew Struzan Batman poster I signed for Adam. What a wonderful thing to do for a child!